U.S. Returns Dozens Of Looted Artifacts To Iraq : The Two-Way Some of the artifacts date back more than 4,000 years. Among them is the head of a statue of Assyrian King Sargon II, similar to one destroyed by militants with the self-proclaimed Islamic State. Some of the artifacts that were handed over to Iraq during a ceremony Monday in Washington, D.C. The U.S. returned dozens of artifacts to the Iraqi government Monday. The cultural treasures, some dating back more than 4,000 years, were looted from Iraq and smuggled into the United States. The head of a limestone statue representing Assyrian King Sargon II. 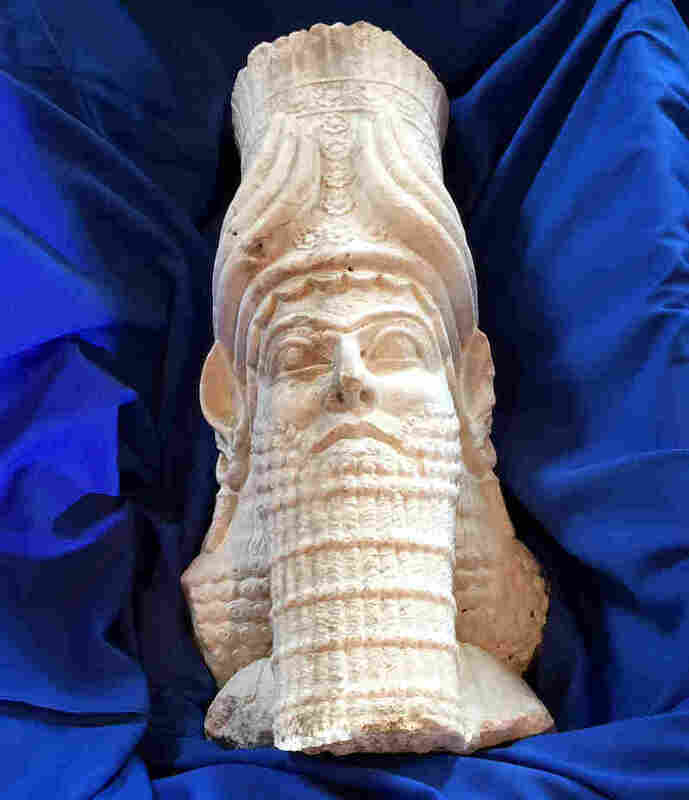 Perhaps the most spectacular item on display at a handover ceremony at the Iraqi Embassy in Washington, D.C., is the head of a limestone statue representing Assyrian King Sargon II. It is part of a Lamassu, where the head sits upon a winged bull. It's similar to one seen in a recent video shot in Iraq that shows militants from the self-proclaimed Islamic State destroying the face with electric drills. This head is in very good condition. It was recovered during an operation called Lost Treasure. Sarah Saldaña, director of Homeland Security's Immigration and Customs Enforcement, says special agents got a tip in June 2008 that an antiquities dealer based in Dubai was selling looted Iraqi antiquities to dealers all around the world. "The special agents seized the limestone statue in August 2008 after it was shipped to New York City by a Dubai based antiquities trading company, owned by that antiquities dealer," Saldaña says. And the investigation uncovered more than just the limestone statue — it identified a broad transnational criminal organization dealing in illicit cultural property. "Some of the network shipments were directly linked to major museums, galleries and art houses in New York City," she says. That information, in turn, also helped with a case called The Mummy's Curse. 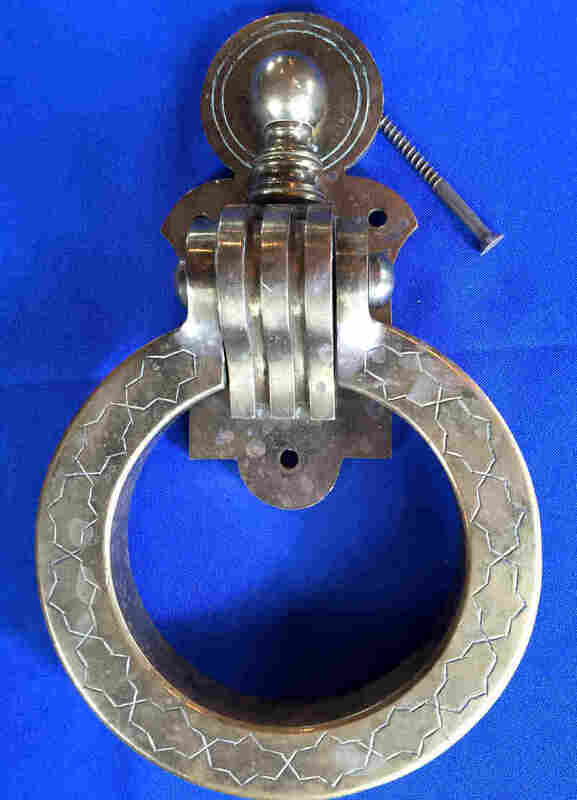 The operation netted most of the items now being returned to Iraq, including ancient swords, clay reliefs and glass vessels, along with a door knocker and water urn belonging to former Iraqi leader Saddam Hussein. One item was found on Craigslist. ICE Senior Special Agent Brenton Easter says looted items will often stay in the Middle East until things cool off. "That material wouldn't necessarily hit the open market for five to 10 years ... because the dealers are smart enough to know that they don't want to actively and openly be participating in something that's illegal," he says. Five people have been arrested so far in the two cases. Easter says agents with Homeland Security Investigations deal with a raft of international experts to help trace the stolen goods. That's important because antiquities continue to be looted in Iraq. "We are getting a good handle on the pieces as they are being looted before they hit the market, and we are creating a database where we will be able to identify these pieces when they do hit the market five to 10 years from now," Easter says. In the meantime, the dozens of antiquities are on their way home to Iraq. Lukman Faily, Iraq's ambassador to the U.S., says the Iraqi government is not worried about their safety once they're back in Baghdad. "No, certainly not, no. ... When it goes to the vault of our museums and others we are fairly confident about that," Faily says. 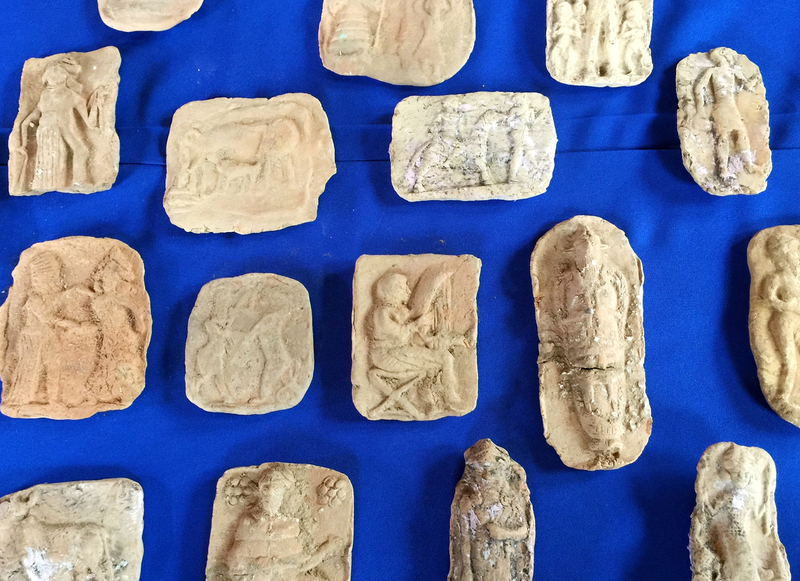 These latest artifacts are among more than 1,200 relics that have already been returned to Iraq since 2008.